A Reuters news report by Robin Emmott and Sabine Siebold shows how devoid the West is of honest, intelligent and responsible journalists and government officials. These destroyed countries posed no threat whatsoever to the countries of the NATO alliance and undertook no aggressive actions against NATO members. How is it possible that Reuters’ reporters and editors are not aware of this? Why do they call an instrument of Washington’s aggression a “defense alliance”? Every informed person knows that there is no need of a defense force against Russia in the Baltics and Poland. Aside from this fact, only an absolute idiot could think that three or four thousand troops constitutes a defense against the Russian Army. 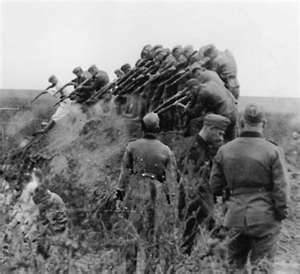 In June 1941 Operation Barbarossa (image right) hit Russia with an invasion of four million troops, the majority German component of which were probably the most highly trained and disciplined troops in military history, excepting only the Spartans. By the time that the Americans and British got around to the Normandy invasion, the Russian Army had chewed up the Wehrmacht. There were only a few divisions at 40% strength to resist the Normandy invasion. By the time the Russian Army got to Berlin, the German resistance consisted of armed children.